Watch this really cool film on FabLabs all over the world meeting in Barcelona. The Book of Peer Production has been released as a special edition of Journal of Peer Production. It consists of papers written by presenters at the Peer Production-track at the Free Society Conference and Nordic Summit (FSCONS) in Göteborg 2014. It is cool, that all content in the book is in the public domain. Johan Söderberg and Mathieu O’Neil explain: „In fact, the commons and peer production are two names for describing the same thing: a particular kind of labour relation. This labour relation is predicated on voluntary participation and the self-selection of tasks.“ — This is exactly what I mean by the commons as being a new elementary form (as used by Marx) of social production opposed to the commodity form. Beim Schlagwort ‚Herrschaftskritik‘ werde ich hellwach. Ein ganzes Buch, herausgegeben und auch überwiegend geschrieben von einem jungen Aktivisten, der Theorie und Praxis verbinden möchte – das klingt außerordentlich spannend. Es handelt sich, wie erwartet, um ein Buch aus der linksradikalen Szene für eben dieselbe – und ihren Nachwuchs. Und als solches greift es nicht ganz ungeschickt Fragen und Probleme auf, in welchen eine herrschaftskritische Perspektive hilfreich sein kann. Copyleft.org ist eine neue Website rund um die Copyleft-Idee und ihre Praxis, vor allem bezogen auf die GPL-Lizenzen. 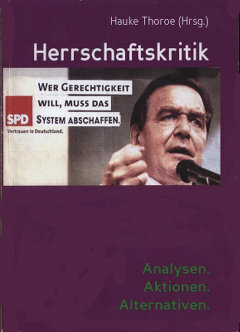 Kern der Website ist ein Handbuch zur Analyse und Anwendung der verschiedenen Varianten von Copyleft-Lizenzen (etwa den Unterschieden von GPLv2 und GPLv3, LGPL und AGPL). Es wird von einigen Fallstudien zur erfolgreichen Durchsetzung der GPL abgeschlossen. Sicher etwas für Leute, die tiefer in die Problematik einsteigen wollen.